So exactly what was I doing driving down the A36 towards Salisbury at 8.30 in the morning in my pyjamas? A good question indeed. I was, of course, trying to photograph the flaming partial eclipse.... as you do. I don't know whether it's to do with getting older (although I should add that I am still in my 40s) but I seem to have a sudden need to witness rare astronomical events - just in case I'm not around for the next one. I should also add that I have little interest in astronomy. I stared blankly at my brother as he talked endlessly about Carl Sagan's 'Cosmos' in the 1980s - he was one of those rare people who had actually read the book rather than just placed it on their coffee table to make them look intelligent. Later on in the same decade, his excitement at the publication of Stephen Hawking's 'A Brief History of Time' was only matched by my lack of interest. To be honest, I'd rather have read the Bible in Aramaic or War and Peace in Alabanian. I can identify The Plough in the night sky, maybe even Cassiopaeia at a push but beyond that the Cosmos is something of a mystery to me. The only black hole I know is our Disastrous Disco, The Husband's beloved Landrover, which seems to swallow up our money like matter being sucked into one, quark is something you use in cooking and critical density just means you are very, very stupid, possibly fatally so! I've been avidly watching 'Stargazing Live' with Dr Brian Cox and Dara O'Briain, chosen probably as the comedian with a head most like one of Jupiter's moons - or possibly because he could be a human representation of the 'No Hair' theorem. Dr Brian is the youthful, modern face of physics and astronomy, a genuine 1990s pop star who now works on the Large Hadron Collider at CERN in Switzerland so there's hope for Kerry Katona yet! (Extra points to anyone who can name the band he was in and their biggest hit without resorting to Wikipedia). I was relieved to hear him tell us that the the Mayans didn't apparently know anything and the world will not end in 2012 after we've forked out all that money for the Olympics. That in itself made it worth watching. I watched fascinated as he took us on a tour of the Universe, teased us with Red Dwarfs and Neutron Stars and told us time and time again that it's dangerous to look directly at the sun, just in case we didn't know, for there was a partial eclipse coming. The day of the partial eclipse dawned reasonably fair in West Wiltshire and from The Boy's bedroom I could see the orange glow of the sun appearing over the horizon but, damn and blast, I couldn't get a clear view because of some inconveniently placed trees. The Husband returned from the school run and I was suddenly seized by an irrational urge to photograph this eclipse but there was no time to spare. "Do you mind if I go and photograph the eclipse in the next village?" I asked, thinking of the perfect spot with no trees to block my view. Grabbing a coat and a camera and the only shoes I could lay my hands on, a rather incongruous pair of velvet stilletos, I jumped into the Disastrous Disco and headed off towards the horizon. There was one small glitch in my plan. The 'perfect spot' was actually facing North so the sun was coming up to my right, hidden behind more bloody trees. I jumped back in the Disco and headed off towards the sun. Every time I got a decent view it disappeared behind a hill - the downside of living in a valley and before I knew it I was on the A36 heading to Salisbury, still in my pyjamas. The sun taunted me, disappearing to left and right but never clearly showing it's sunny smile and the nearer I got to Salisbury, the thicker the cloud got. I turned off into a village which I knew had open views across the Downs. It also has a large lake and lakes in winter often mean mist. As I neared the centre of the village, the surrounding landscape was swallowed up by a thick, swirling pea souper. The sun was nothing more than a fuzzy orange glow. Worse still, I found myself practically outside the house of The Boy's first love. Teenage relationships are difficult enough without having to explain away the presence of your mother in her nightwear driving round her village. Despondent, I decided to head home keeping a firm eye on the rear view mirror just in case. Sure enough as I reached a point in the road where stopping meant certain death I caught the merest glimpse of the partial eclipse. My efforts photograph it backwards over my shoulder resulted in a few blurry shots of my right ear and the approbation of my fellow drivers speeding to work with not the slightest care for the astronomical event happening behind them. I pulled up at River Cottage and walked purposefully towards the house as if it was perfectly normal to passing traffic that I should be out in my pyjamas and a pair of high heels. "Did you see it?" asked The Husband. "Nah. I just couldn't get a good view". "Shame, you should have stayed here. I got a glimpse of it from The Boy's bedroom"
"Did you get a photo?" "Er, you had the camera, remember"
Bums! Never mind, I still had the Quadrantid Meteor Shower to look forward to. Except that I forgot to set my alarm and missed the whole thing. I watched it on the tele that evening. Then the 'round the world' version. I think the region was covered in thick cloud that day so any hope of seeing it for real was buggered. On another interesting note, this month there are five Saturdays, Sundays and Mondays. I was informed in a text message that this is extremely rare and occurs once every 823 years, except that amazingly... this year it happens twice because July has it too. Not sure why this is so incredible. Lots of months have 5 sets of days. It said that if I didn't send the message on to 823 people, my luck would run out and I'd be left with peanuts. 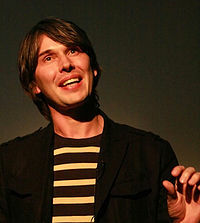 I've never heard of this Brian Cox, let alone know which band he was in. I think I've lived abroad too long. The programme sounds fascinating but I only have frog TV here. Sarah, my friend in Montpellier reported heavy cloud cover so I was quite excited that we had a little bit of clear sky, not that it lasted for long! Thanks for the interesting note about the plethora of Saturdays, Sundays and Mondays. Does that mean tht I now have to pass it onto 823 people or risk certain doom? I've already left a Christmas decoration up so things aren't looking good! Dumdad, I'd put money on your knowing what group he was in and what their biggest hit was... once someone tells you that is. He has loads of stuff on You Tube from the various TV documentaries he's done and if anyone is going to get you excited about astronomy he will. That's assuming you want to of course! Dr Brian and Dara O'Briain - surely a dyslexic's (and Word's spellchecker's) worst nightmare? But I really, really want a phone with apps. I know the band and the hit. It was solid cloud here - we never had a hope of seeing the eclipse. And I am not allowed outside the house in my pyjamas as it is "embarrassing". They don't know I sneak out before they are up and get the milk in still in my PJs though. The lunar eclipse....missed it because the alarm didn't go off. Bought new alarm clock from gentleman on the kerb in the local town together with some sweet peppers and a bunch of coriander. Meteor showers....missed it because the new alarm didn't go off. Returned to man at kerb who offered me two bags of sweet peppers in recompense.....and said the shower had been obscured by cloud anyway. Alienne, well done but you didn't say who or what but I know you know! I learn the pyjama trick in France where it was not unusual to see the Mamies out in the dressing gowns and slippers nipping to the village shop. Apparently it's the same in Liverpool! Fly, it certainly doesn't seem to be does it! D-Rream ..."Things can only get better"
and they did for this Northern Lad ..!! We have a hugh telescope .. still boxed in the loft !!! Which 5 celebrities would you punch? Kenneth Tong - D*ckhead Extraordinaire! 2010 in a nutshell - a rather large one!